Laminate flooring is a great choice for any home. It offers a great value because it’s affordable as well as durable in many situations. And with the latest printing and manufacturing processes, it looks and feels just like the product it imitates. That said, not all laminate flooring is created equal. There are a few things you should consider before you make your final selection. While your lifestyle will dictate the best choices for you, you should also keep these things in mind. A boards thickness will ultimately determine its durability and overall feeling. 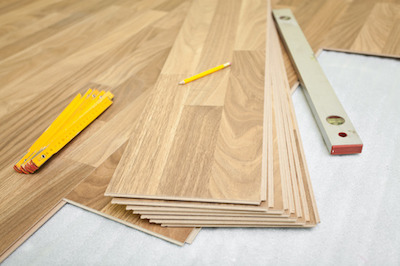 A high quality laminate product will be thicker, usually between 8mm and 12mm thick. Ask to see the difference. What are your goals for the room? A bathroom will have different goals than a family room. A room with high traffic will have different needs than one with low traffic. Will the room be subjected to high moisture, such as in a bathroom? You can also create different appearances, depending on the laminate product you choose. You can use wide planks to create depth in a smaller room, use lighter laminate to increase the brightness in darker spaces. Start with what you would like to accomplish and plan from there. Any high quality laminate will be able to withstand harsh punishment you family can dish out, even if you have kids and pets. That’s why many turn to laminate instead of using hardwood. Also, consider selecting a color that matches your needs. Dark laminate shows more pet hair and dust; lighter laminate shows mud and spills. You can also choose textured laminate to look like ceramic or stone, which will give you even more durability throughout your busy days. It’s also important to consider what type of flooring exists in the other rooms. You’ll want to choose a flooring that closely matches the surrounding floors, both in color and in style. Complement is most important when you’re creating a warm and inviting décor. High quality laminate is very resistant to staining and is durable in many situations. Still, you’ll want to make sure you get a good warranty just in case. The best brands of laminate will offer a 30 year warranty to guarantee your floors against staining, fading, peeling or other defects.